I'll admit having a bias to when Lessig is talking, but I really think he has a point. About a year or so ago, I tried a project in which I would stay away from teh intarwebs for a whole month. It didn't go so well, and was abandoned after a little over a week. Be nobody (well, more "nobody" than usual) on the internet during the month of September. I've got some throwaway accounts that I can masquerade as if I get hard up for staying in touch with people. I don't have to deal with the hassles at work. I don't even have to stop reading things pointed my way. Just a month of. Sabbatical. Vacation. Whatever. Maybe I'll repost stuff that I do in October. Maybe I won't. A month off from hitting reload on a bunch of sites will just make it feel like christmas for any activity come October 1st. been feeling a little more malaise than usual lately. I think it might have something to do with absorbing experience than creating experience lately. But watching this seems a lot like McCain is doing the Reagan routine, poorly. Again, acknowledging that this was made up of hand-picked clips to prove a point, but holy something of something, this strikes me as downright silly. If you don't have an hour to spare, I highly recommend you bookmark it and watch it when you can. Now, I don't know how you feel about the subject, and I don't know whether you care about either of the U.S. presidential candidates. But, having listened to Rush Limbaugh hyperventilate on my morning commute this week, it's fun to see one bias vs. another. Further commentating aside, compare and contrast. Huh. Wish I could've found something a little better. If you know of another clip or article or whatever, leave it in the comments. So, yeah, regular schedule be damned, a vote was taken and the voice of the masses said "No, you really should do another Ongoing Dispute." Who am I to argue with the popular vote? So the grocery store down the street is closing. I guess it's been a bit of a fixture of that intersection for a couple decades. 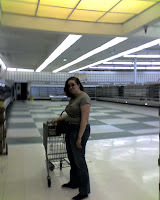 So, being the good vulture that I am, Manya and I went down to see if we could find any deals. 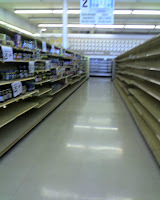 Meat, dairy, bakery and produce sections were already stripped bare. It was rather surreal, actually. I just kept thinking that the place, picked through as it was, looked like my pantry after it's been too long since I've bought groceries. Some condiments, some canned horrors, some frozen novelties. Anyhow, we picked up a few items. Next, across the street to some discount store. Picked up a couple more clocks for the "Wall O' Clocks" I'm building in my living room. More on that another time, but I'll say that one choice find is the wall-clock (with REGULATOR pendulum) with a depiction of the Last Supper on the clock face. 8 bucks for that one. Yeehaw. A couple doors down is a smallish independent bakery. Me, resolving to buy from local independents when I can (or when it makes sense), figured "Hey, why not?" Nothing of interest today. A few loaves of bread, some cookies and other confectionery. Bonus points for not being filled to the brim with cupcakes, as so many other places are these days. Stupid fads. And then down the street to an independent butcher. Been meaning to check this place out ever since I moved, but hadn't had the opportunity. Manya and I made jokes with the lad working the counter, picked up a couple steaks for tonight's dinner (not cheap, but cheaper, and appear to be better than anything I can get from one of the grocery store chains) Cash only, glad I still carry some.